The Carolinas are a great place to live, work, and raise a family. 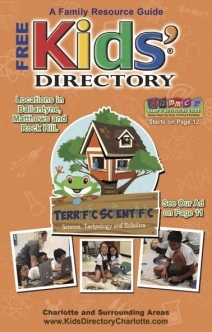 The Kids’ Directory is here to make life easier, and more fun, by featuring products, services and businesses that cater to your kids and family. To see our Current Issue, click on the cover to the left. To see our Event Calendar, click the tab above. And best of all, the Kids Eat Free (or really cheap!) listings... the best resource for family dining in town!